Improving four-year-old Ninth Legion (Fastnet Rock x Xaar’s Jewel) rose to the occasion in Sydney on Saturday claiming a breakthrough victory in the Gr.2 ATC Villiers Stakes over 1550m. The Segenhoe Thoroughbreds owned galloper was forced to work at both ends of the weekend’s feature race in Australia, but he was not to be outgunned. Ninth Legion held a length margin on the line over Limes with Alma’s Fury back in third in the 14 runner capacity filed. 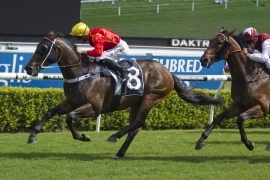 An $110,000 purchase from the draft of Edinglassie Stud at the 2011 Inglis Australian Easter Yearling Sale, Ninth Legion has turned his career around since being gelded at the start of the season. ''He is still a work in progress but all credit goes to Segenhoe for agreeing to geld him,'' Michael Hawkes said. Ninth Legion joins Shamus Award, Atlante and Samaready as recent feature race winners purchased from the middle market of the Easter Yearling Sale. The first class quality in the $100,000 to $300,000 range has become a great hallmark of the prestigious auction. Bred by Davilora Lodge, Ninth Legion is the 53rd stakes-winner for Fastnet Rock, which has nine yearlings in the 2014 Inglis Melbourne Premier Yearling Sale and 62 yearlings set to be offered at the Inglis Australian Easter Yearling Sale next April. Thanks to his Villiers win Ninth Legion is now exempt from the ballot for the $3 million Group 1 ATC Doncaster Mile. Jockey Peter Robl believes Ninth Legion can make the step. "If he continues to progress like he has this preparation, then he would be a genuine lightweight chance in the Doncaster,'' Robl said. The Doncaster is due to be run at Randwick on Day One of ‘The Championships’, only days after the Easter Yearling Sale on 8, 9 & 10 April 2014.